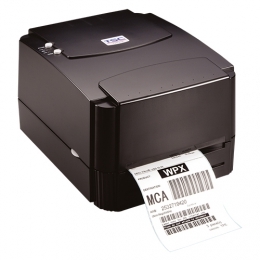 The desktop label printer TSC TTP-244 Pro is the result of successful further developments in the TTP 244 Series. The compact thermal transfer printer has everything that a classical market-entry printer needs quality, affordable printing and reliability - with above-average characteristics. With a print speed of 127 mm per second the printer is 25 faster than its predecessor, plus it handles 300 m thermal transfer ribbons and label rolls with a diameter of up to 204 mm. This reduces the daily operating costs of ribbon and media changes to a minimum, which makes the market-entry printer very attractive for usage in incoming goods, shipping and product labelling.